2013 has left us for 5 days already, Yet the memories through out the year still keep flashing in my mind. Cheers, laughs, anger, exhausted, sad, happy. Everything. When I think about it, yeah, it just another year passing by. We get older, our families grew bigger. Some people lost their beloved one (Al-Fatihah), peoples come and go etc. But maintaining what we have achieved so far and looking forward on what we should do for coming years does matter. 2013 mark a new benchmark for us in DSP. I still remember when we were just a 2 young-fresh-graduated engineers who have been asked by their former campus housemate to capture their engagement in late 2010, Alhamdulillah, along the years, now we are a team of 6 peoples, have a proper business company, a decent photography equipment, a uniform, start to get recognized by the public, and many more. I personally never thought that we can survive until 2012, let alone achieving what we have today! 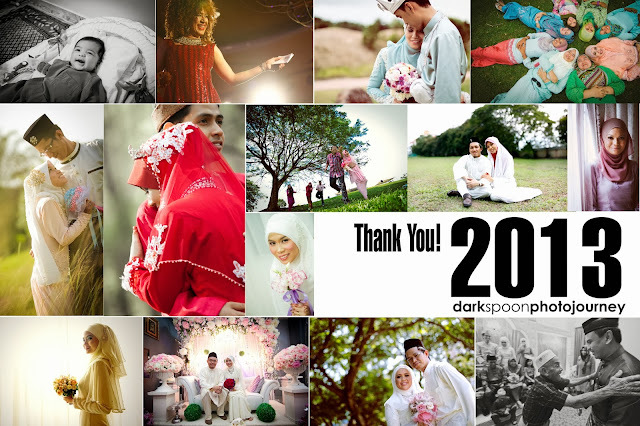 Alhamdulillah, up until now photography jobs keep coming in and some slots in 2014 already been booked. Insha-Allah, in 2014 we are looking forward to the upcoming challenges. I hope that we will keep improving and will continue to give all out so that when the times come, we can enjoy the moment when we see our client happy faces receiving their life-time memories captured. Thank you Allah, who never stop giving, taking, testing us, everything. Alhamdulillah!, Allahuakbar! Thank you to all of our clients who never stop trusting us in capturing your once-in-a-lifetime event. Thank you to our team members, who never stop sacrificing their precious weekend just to keep up the good work.